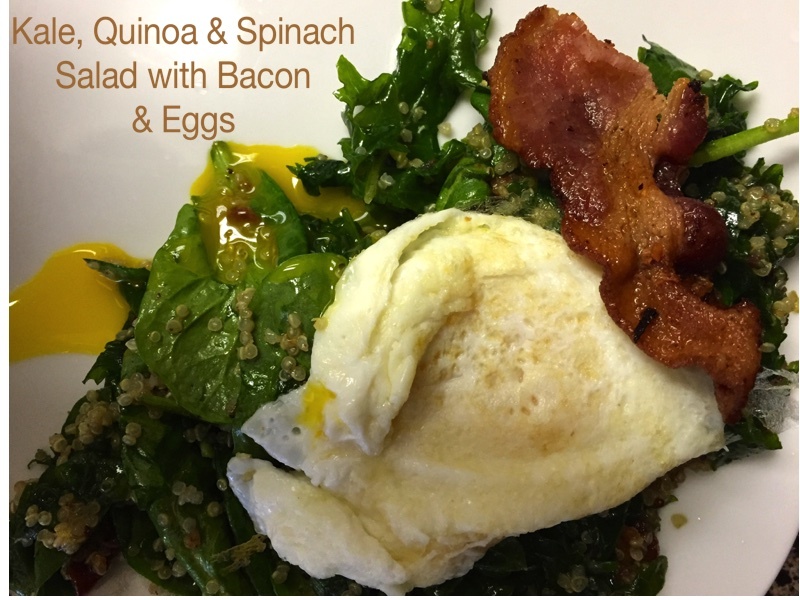 The Experiments Week 13: Kale & Spinach Salad with Bacon Vinaigrette & Eggs AMAZING! Holy Cow. Seriously. This is UNBELIEVABLE. Delicious. Amazing. We loved it. Yes, it has some fat. Let’s just put that out there. Then let’s talk about the kale, quinoa, spinach, avocado–and loads of protein! I served this with a chicken dish I wanted to try, recipe coming soon, but it is A MEAL all by itself! Let’s talk about how to make it! The recipe below will serve 4, but it is easily cut in half for 2. Cook the quinoa according to the package directions. You will use about 2 cups cooked. Once it is complete, place it in the refrigerator (or freezer if you are pressed for time:) to cool. Cook the bacon in a pan until crispy. When done, reserve the bacon grease and place the bacon on a paper towel-lined plate to cool. Crumble all but two slices into pieces. Cut the two extra in half. 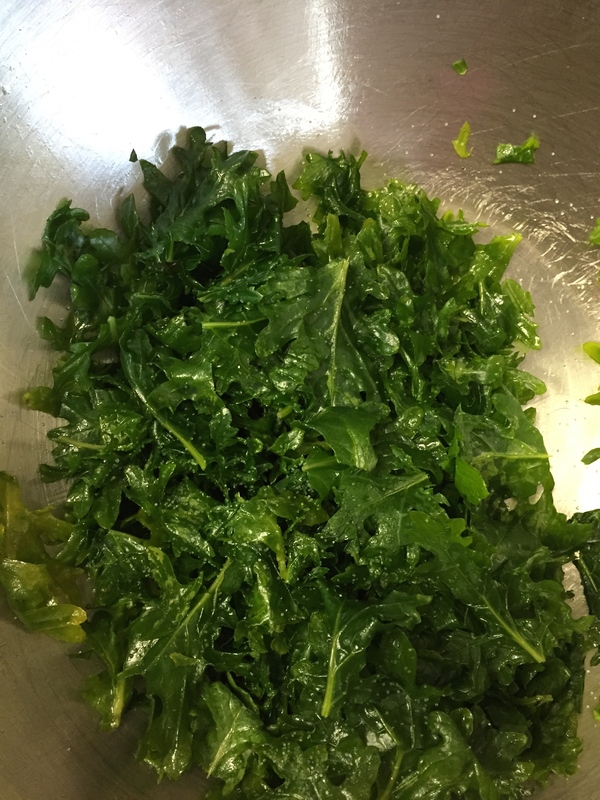 Put the kale in a large bowl and top with the olive oil and sea salt. Massage the kale leaves with your hands until they become soft and lose their bitter flavor, about 3-5 minutes. 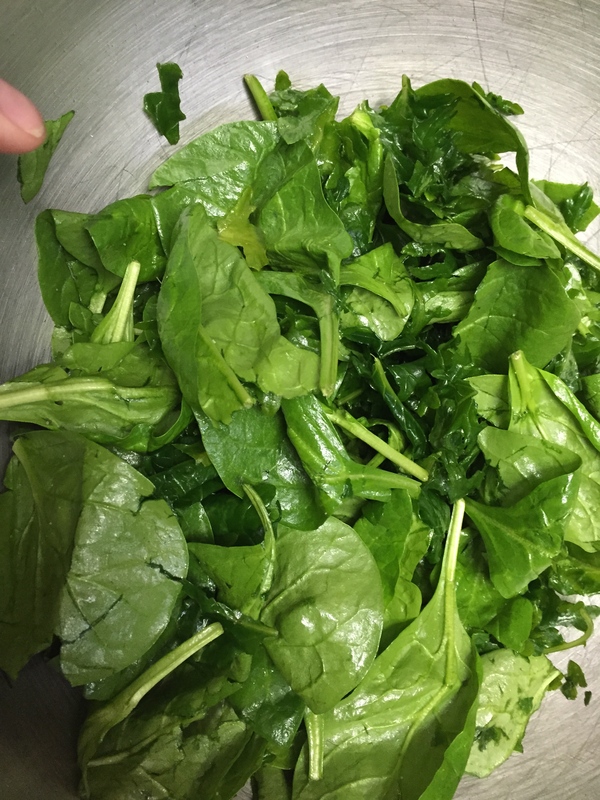 Add the spinach to the bowl and stir the mixture up. Scoop about 3 tbsp of the bacon fat left in the pan into a small saucepan and turn heat to low. Now you should whisk in the vinegar, mustard, and honey. All you need to do is let this warm on low while you cook the eggs. Cook your fried eggs: spray a small nonstick pan with olive oil spray. We left the eggs still a bit runny as the “juice” soaked our salad as was AWESOME. If you do not like them this way, fried or hard boiled will still be tasty. Now add the crumbled bacon pieces into the warm dressing and stir. Gently stir your cooled quinoa and chopped avocado into the salad greens and top with fresh ground paper if you wish. Now pour the dressing over the mixture and toss gently. Place portions on each plate and top with your eggs and a half slice of bacon. This is a BURST of so many FLAVORS! I considered some feta or other cheese, which would still be good, but it just plain does not NEED it!